Welcome to the website of the Australian Child and Adolescent Trauma Loss and Grief Network. We are delighted to have you visit this virtual space where you can link with an online community and information resource for those interested in children, adolescents and their futures. The network presents an exciting opportunity to bring us together to work towards the common goal of supporting positive and hopeful outcomes for young people and their families experiencing trauma, loss and grief. The earlytraumagrief website is a means of linking people from different settings and contexts, and helping build and circulate knowledge and information, so we can better recognise and respond to children and young people’s diverse and often complex needs in the face of threats and losses encountered early in their lives. The Australian Government has recognised the importance of this opportunity to assist children, young people and their families and has provided support from the Council of Australian Governments (COAG) Mental Health funding. I look forward to you being a regular website visitor or joining with us as friend of the network or network member so you can be a part of this valuable national initiative. What is the Australian Child and Adolescent Trauma, Loss and Grief Network? The Australian Child and Adolescent Trauma, Loss and Grief Network (ACATLGN) is a network that works with a team of experts to bring together evidence based resources and research in order to make them more accessible to those working with, or interested in, children and young people who have been affected by trauma and grief. ACATLGN aims to increase awareness and knowledge amongst a range of professionals working with children and young people in order to improve the wellbeing of children and adolescents affected by trauma and grief. ACATLGN provides up to date information and educational resources for professionals and other members of the community. Every year, thousands of Australian children experience adverse life events associated with loss, threat, exposure to violence, abuse, natural disasters, severe illness or injury. life-threatening experiences such as disasters, terrorism or other major incidents. While many children are resilient, these experiences can have both immediate and long-term effects on their mental health and ability to function in family and school life. The ecological model of childhood development (see diagram) outlines how children’s experiences and development are products of the many relationships, settings and broader contexts they encounter. This model can help us to understand the effects of, and influences on, childhood adversity, and inform the way we collaborate as members of this network. A range of events associated with the loss of loved ones and exposure to violence, abuse, natural disasters, severe illness or injury can lead to psychological trauma and loss and grief experiences in children and adolescents. The idea that children’s experiences and development are products of the many relationships, settings and broader contexts they encounter (and the links between these systems) is now widely accepted by clinicians and researchers as a way of understanding children’s health and wellbeing (Bronfenbrenner’s Ecological Systems Theory). This perspective has also been used to develop national policies towards children’s mental health. The Australian Child and Adolescent Trauma, Loss and Grief Network uses an ecological perspective to understand the effects of, and influences on, childhood adversity. Our recognition of the interdependence between the different settings and contexts in children's lives also informs the way we collaborate as Network Members. 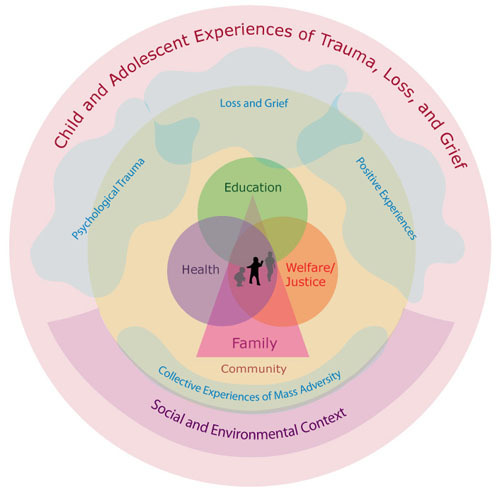 Through a consultative process in 2007 and 2008, the network identified 10 focal areas for practice and action regarding children’s exposure to, and experiences of trauma, loss and grief, each understood within the context of this ecological model. Bronfenbrenner, U & Morris, P.A. (1998) In (Series Ed.) & R. M. Lerner (Vol. Ed. ), Handbook of Child Psychology: Vol. 1. Theory (5th ed.). New York: Wiley. Theoretical models of human development. In: Lerner RM, editor. Handbook of child psychology. 5th ed. New York: Wiley. pp. 993-1028.